1. “Sri Rama Jaya Rama” Mantra was chanted during Deepa Pooja, Shivalinga Pooja and daily by our Balwadi school children, cultural class students and during monthly meetings by our Balwadi teachers and Social Workers. Every month nearly 7, 45,694 times mantras were chanted in 84 localities. 2. Through 74 Balwadis, 2,116 rural Children were nurtured. In all the Balwadis, Malt along with hygienically prepared highly nutritive lunch with vegetables was served during the day. And in the evening vitamin-rich cereals were provided to the children. 3. In our Medicare Programme, 1665 patients were examined and treated for various common ailments, through 14 Rural Medical Centers in Kanyakumari, Nellai and Thoothukudi districts. 4. Eye camps were conducted at 1 places, in Kanyakumari, and Nellai districts in which 194 were treated for their eye ailments and 42 were operated for cataract. 5. In 183 Samskara Vargas, 6634 students participated. The students were taught about the values of Indian Culture, through games, lectures & lessons. The feelings of oneness were strengthened among participants, through patriotic songs and games. 6. Under Adopt a Grannie Program, 53 destitute and old people were provided with monthly solatiums, in the form of rice, dhal, oil, etc., for their livelihood and 78 persons provided rice only, in Southern four districts of Tamilnadu. 7. 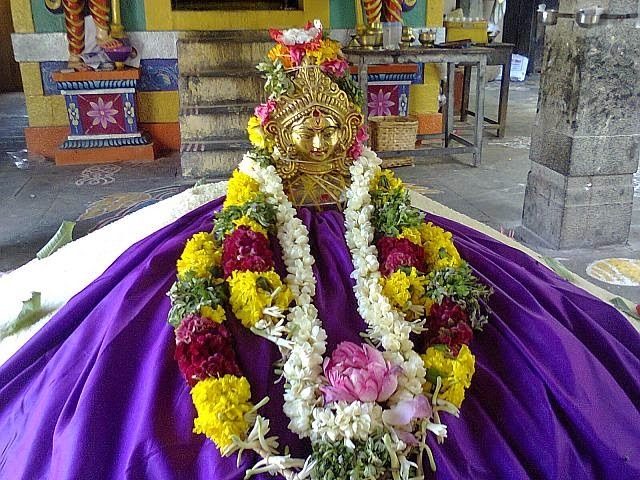 Monthly Deepa poojas were organized in 227 village temples in five districts of Southern Tamilnadu, in which 9314 ladies participated and offered prayers for the welfare of self, family and the society. 8. Under Amrita Surabhi Scheme, our Kendra workers collected 1170 Kgs of rice from Kanyakumari, Tirunelveli, Thoothukudi and Ramnad districts. 10. Vivekavani Subscriptions for 69 for one year were collected and 1 Yuva Bharathi subscription collected. Also contributions were received for 28 as Patron . 12. Swadhyaya Varga was organised, at Aruppukottai, in which 15 persons participated. 13. Yoga Varga has been conducted at 02 places, Kovilpatti and Aruppukottai in which 22 persons attended. 14. 4 tailoring units are functioning well in Nellai & Kanyakumari districts with the total attendance of 84. 15. Shivalinga Poojas were conducted at 03 places in Kanyakumari District and 144 members participated. 16. Durga Pooja was conducted at 02 places, in Kanyakumari District in which 139 devotees participated. 17. SV Vizha was celebrated at 3 places in two district in which more than 1800 devotees participated. 18. 1008 Deepa Poojas was conducted at Shenbagavalli Kovil in Kovilpatti district where 1150 devotees participated from about 40 villages and in Nellai District at Vallioor 508 Deepa Poojas was conducted at Shencottah in Tirunelveli district where 582 devotees participated. 19. Anna Pooja was celebrated in Thoothukudi where 200 persons attended and 3500 kgs of rice was collected. 20. RDP senior workers (27) went for tour to Kolkatta, Dakshineswar, Kamarpukur & Jeyarambadi. I. Shri Mavna Gurusamy madam- Thoottiyodu Kanyakumari district- 100 Kg. II. Indhu Primary school- Thirumalapuram Nellai district- 100 Kg. III. Ovai Asiramam- Siva sailam Nellai district- 100 Kg. In our balwadi one Selvi.Sankara priya has last her gold ear ring and informed us the matter. All of us searched for the gold earring which was not available. The child was weeping for a long time. After wards one child named Dhanush has gone to drink water. Nearby that place she has found the gold ear ring and handed over it to me. All of us felt so happy. That child has acted in good manner without having any desire over the gold ear ring. Her character was very good. In our balwadi Selvi Shanmugapriya is studying. Daily she will clean all the plates of students and afterwards we will provide food and she will take each and every plate with food used to give to all the childs. Only after distributing all the plates to the childs she will take her food. Her activity was highly impressed to us. Her habits from childhood made us to wonder. In our balwadi one selvan. M.Hari aged 3 years is studying. He was stammering and can not speak well. His parents were worried very much. They used to en-quire us whether he will he recovered from stammering. We took sincere efforts and gave special attention to him to speak very well. We gave training also to speak in a good manner. Now he is able to sing songs and speak very well.His parents are so happy and expressed their unbound happiness towards our efforts.